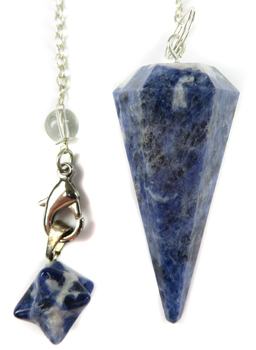 A faceted Sodalite pendulum with a Sodalite merkaba that can be detached and worn as a pendant. Comes with a velveteen pouch. Sodalite: Brings order and calmness to the mind. Encourages rational thought, objectivity, truth and intuition, along with verbalization of feelings. Brings emotional balance and calms panic attacks. Enhances self-esteem, self-acceptance and self-trust. Said to combat radiation damage by soaking up electromagnetic smog. Also said to help prevent insomnia. Chakra(s): Throat, Third Eye. This is a star tetrahedron consisting of a two interpenetrating three-sided pyramids that form a three-dimensional Star of David. Symbolically, it links the mind, heart, and body in a way that produces the MerKaBa. This term means “chariot”? in Hebrew. In the eighteenth dynasty of ancient Egypt, it ment MER (rotating fields of light), KA (spirit), and BA (soul). MerKaBa activates the protective love of the Universe and awakens, heals, and transforms on the spiritual, physical, mental and emotional levels.